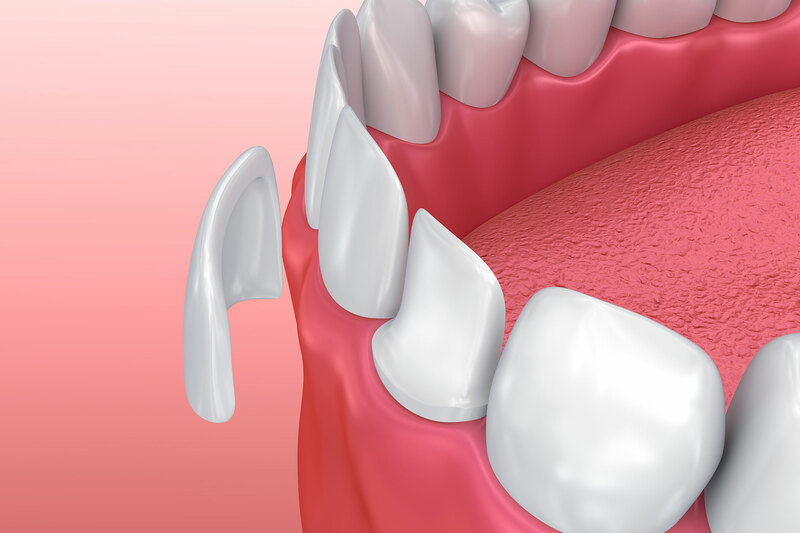 Dental Veneers are thin, custom-made shells of material that covers the front surface of your teeth. To improve the overall look, dental veneers are colored like your other teeth and are bonded to the front of your teeth. The first step is diagnosing and treatment planning. This involves a discussion about the goals you have and what you’re trying to achieve. We will then examine your teeth to make sure that veneers are the right choice. If it is the right choice of treatment, we will discuss the procedure with you. The next step is preparing your tooth (or teeth) for a veneer. We must remove approximately 1/2 millimeter of enamel from the surface of your tooth, which is approximately the thickness of the veneer. A local anesthetic will be given in most cases to ease any discomfort. We will then make a model or impression of your tooth, which is then sent to a laboratory to construct the veneer. Temporary dental veneers can be placed in the interim while the veneers are being created. The final step is bonding the veneer. Before the veneer can be permanently attached to your tooth, we will make sure that the tooth fits appropriately and the color is correct. Before we can bond the veneer to your existing tooth, we must clean, polish, and etch the tooth, which will help create a stronger bond. After we properly place the veneer, we will apply a special beam of light that will activate the chemicals in the cement to harden and cure quickly. After the veneers are attached, we will examine to make sure that your new veneers look flawless and your bite is optimal. Typically a follow up visit is required so that we can do a final check on your veneer. Make a dental appointment today at our Coral Gables office!